From LeClaireRyan, Corporate Counsel, Richmond, Va. … In a June 2011 decision, the U.S. Supreme Court reversed a New Jersey Supreme Court grant of personal jurisdiction over a non-resident product liability manufacturer. Vince Hagan Co. has announced a horizontal mixer with 8-yd. yield for roller-compacted concrete mixer and 10-yd. yield for cement-treated base mixes with ½-in. and higher slump. The model is Plant Mixer Manufacturers Division performance rated for a 30-second mix time in 4- to 6-in. slump material and 4-in. slump or less paving loads. To ensure concrete keeps pace with steel in an increasingly common technology platform among architectural, engineering and construction professionals, ACI has scheduled the inaugural Building Information Modeling (BIM) of Concrete Structures Technical Committee 131 meeting during the Fall 2009 Convention Nov. 8–12 in New Orleans. 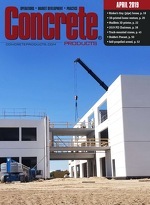 Recently placed on Home Depot’s Eco Options list were several Rapid Set cement products reportedly suitable for concrete repair and new slabs--Cement All, Mortar Mix, and Concrete Mix. Action On Remediation Agg Industries, Saugus, Mass. Feds Find Unfair Labor Practices At Kieft Bros.
National Precast Concrete Association relocated from its longtime Indianapolis office to a building at 1320 City Center Drive, Suite 200, Carmel, IN 46032. Product line includes 17 new or improved models among 22 offerings, with lift capacities ranging from 1,740 lb. to 35,405 lb. maximum rating at a 14-ft.
With established footholds in Georgia and the Carolinas, Thomas Concrete recently became the second-largest ready mixed producer in the Charlotte market, acquiring the ready mixed division of MacLeod Construction, Denver, N.C.
Altus, a private equity firm whose past investments in concrete have included Michigan-based Durand Forms Inc., announced Sept. 2 acquisition of D.S. Brown Co.
Polylok, Inc., has introduced Rebar-Lok to ensure that reinforcing rods in concrete masonry units (CMU) are properly positioned during wall construction. With the Los Angeles City Council adoption of a building ordinance requiring new commercial and high-rise residential structures exceeding 50,000 sq. Demand for brick and block products is projected to increase 4.1 percent annually to $7 billion in 2010, with consumption upward of 14.5 billion units. Against a calming of the U.S. economy, cement consumption is pacing 129.6 million metric tons this year, a 2.3 percent boost compared to 2005 shipments. STEAM GENERATOR Company's latest Steam Flo model serves as a portable source of low-pressure steam to accelerate curing of cast-in-place or precast concrete.